Two comics from August 13, 2014. Plus your Nerd Confessions (about your favorite gods in comics). Special Live Studio Guest: Eisner-nominated writer Christopher Sebela. 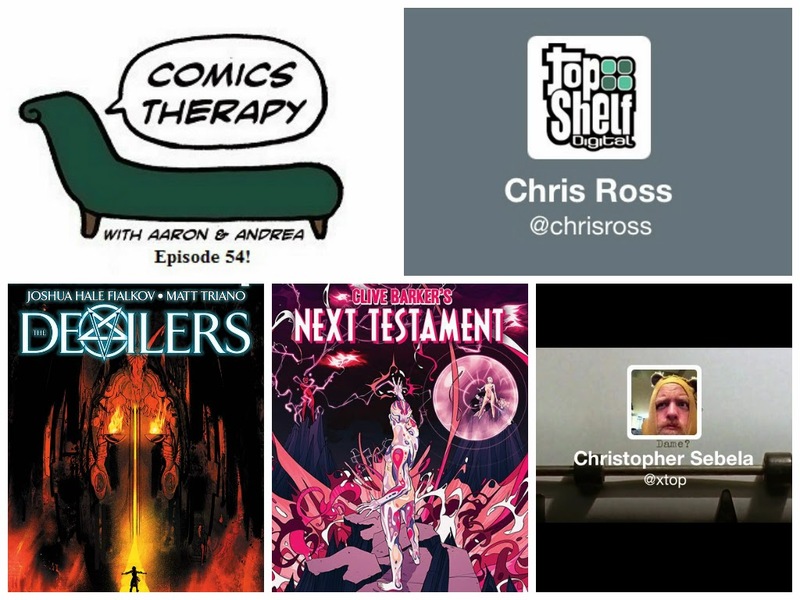 On The Couch: Chris Ross, Director of Digital Publishing and Eisner-nominated Lead Designer for Top Shelf Productions. This week’s theme is the gods must be crazy. We’re talking about two books that illustrate how fucked up the powers that be - or not to be - really are. And they definitely hold a grudge against the women and men created in their image. So much so that sometimes it’s not clear whether we’re talking about the good guys or the bad guys, the gods or the demons themselves. This episode was recorded LIVE AND IN PERSON for only the second (and possibly final) time ever, and features not one but TWO Eisner-nominated creators named Chris! That also means the audio quality for the first half of the show is not up to our usual standards, but hopefully we made up for it with bonus hilarity. Chris is the Director of Digital Publishing for Top Shelf Productions. He’s also their lead designer, and you’ve seen his work on Nate Powell, John Lewis and Andrew Aydin’s March, Mark Russell and Shannon Wheeler’s God is Disappointed in You, Jeff Lemire’s Lost Dogs and Underwater Welder and of course Ed Piskor’s Wizzywig, nominated for Best Publication Design, probably for it’s sweet dimensional cover hotness. We talked about what exactly all this production stuff means, and some good old fashioned digital vs. print ideas. Also scotch. And wine.